Barely 3 months after the last wave of scarcity of Premium Motor Spirit popular called petrol hit, the recurrent thorn in the flesh of Nigerians is here again! Fuel scarcity, arguably the 2 words that Nigerians dread the most is back and this time around, it hit without warning. It is that period in the lives of Nigerians when more hours are spent in long queues at filling stations and the attendant traffic caused by the queues, than man hours spent at work or doing anything productive at all. It is a time when the masses experience untold hardship because of the resultant effect of the almost certain hike in the price of fuel on the prices of every other commodity and by extension their pockets. It is a period of great pain and discomfort in moving around for commuters. At times like these, the petrol station attendants and black market operators become King, as they call the shots and smile to the bank at the expense of the exploited populace. The news is that the Major Oil Marketers Association of Nigeria (MOMAN) suspended further importation of fuel, pending when the federal government settles the subsidy arrears owed it, as well as the decision by banks not to grant further credit facilities to MOMAN because of its huge debt profile. Other theories include the assertion by the NNPC that retail outlets are responsible for the scarcity, claiming that many are hoarding the product, coupled with panic buying by motorists, with the corporation promising to inject 688 million litres of PMS into the market to alleviate the effects of the situation. Yet another school of thought is of the opinion that a rumored further decrease in the price of petrol is the reason why some petroleum marketers are afraid to buy more petroleum products after exhausting what they have, due to the fear of being forced to sell at a loss if government reduces the pump price of petrol. To the lay man, all of this is confusing and translates to only one thing – He cannot get fuel. The average John Doe or as a matter of fact, Lolade Ajekigbe on the streets just wants to be able to walk/drive into any petrol station, get fuel with ease, and at a fair price of course. Is that too much to ask of a government by its citizenry? It is bad enough that we barely enjoy electricity supply these days, yet the exorbitant bills charged by PHCN at the end of the month remain constant. It is bad enough that water supply is a mirage in the average Nigerian home. We dig our own boreholes and still have to resort to this over priced fuel to pump water. It is bad enough that the average Nigerian is already jaded by all the unending problems that currently plague the country. A lingering fuel crisis will be the last straw, as virtually all economic activities are in one way or the other tied to the availability of petroleum products . What irks me the most is that this issue of fuel scarcity has been a long standing problem which occurs at least once a year (in a good year), yet successive governments have been unable to proffer a lasting solution to it. Instead, the government of the day would rather politicize the matter, with the PDP Presidential Campaign Organisation claiming that the main opposition party, the APC connived with petroleum product marketers to frustrate and sabotage the supply of petrol to fuel stations in order to create artificial scarcity, with the aim of creating tension within the polity ahead of the forthcoming polls. What they don’t realize is that admitting the opposition is responsible for this problem is in itself an admittance of gross incompetence and failure on the part of the incumbent government! Why is every thing that has refused to work under this government always attributed to the opposition? What concrete steps have been taken concerning the forensic audit report of Pricewaterhouse Coopers on the NNPC with a view to getting to the bottom of the missing money allegation? If the government of the day is overtly or covertly admitting that it cannot live up to its responsibilities to the people, then it should throw in the towel instead of blaming its trademark characteristics of corruption, mediocrity and incompetence on a group of people. 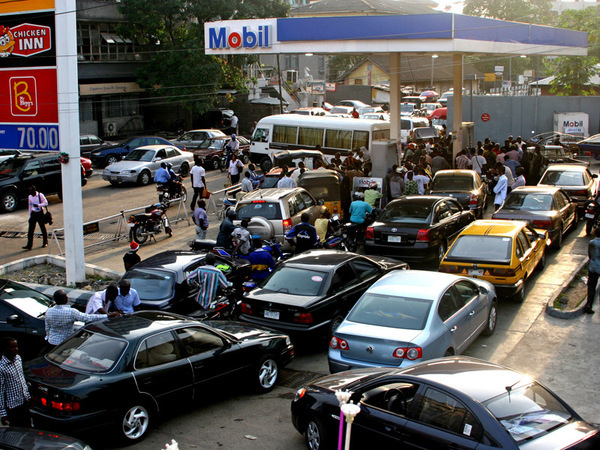 The recurring fuel scarcity just doesn’t make sense! Thank goodness the situation is better today, but the sooner a definite solution is found for this problem the better. You can say that again. Thank you. To make matters worse, PHCN has refused to give us light for 3days now. Me seriously don tire for the APC, PDP, Fuel scarcity palava. My pikin no know all those ones, she screams @ night as if it’s my fault. God help Nigeria!!! Loool, Awww, poor child. I have stopped counting the days since we last had power. It’s really tiring! God help naija. Thanks dear. *sigh*… we are being hit from all angles. name it! the list is simply endless. Its like a huge golden chest … however; rather than this chest been full of treasures, its is overfilled with problems. The most frustrating aspect is the sheer irresponsibility of the Giovernment towards these issues. and when you even begin to try and rationalise for the Government, A GEJ pops up on your TV screen to talk gibberish and embarass your intellect with nonsensical talk. we need our own “mad Rawlings” to wipe them all out in one full swoop. At least the late Gen Tunde Idiagbon said it… that for the nation to be good, they all (al of them that have governed and still goeverning the nation as at that time) need to die including himself. Oh I love the idea of a “mad Rawlings.” I truly believe we need someone and something radical in this country…and urgently too! Thanks boss.